The Nigerian star will be heading to Swedish Open, which holds next week in Stockholm, Sweden. 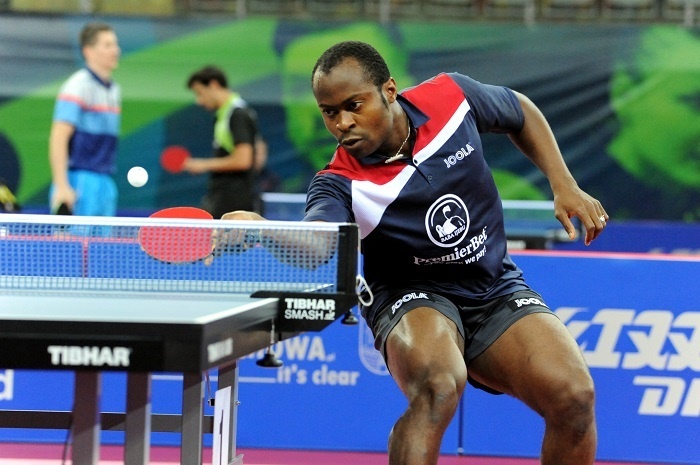 Things did not pan out well for Nigeria's table tennis sensation, Aruna Quadri, at the German Open following his early exit from the competition. Quadri narrowly loss to unknown Hungarian – Bence Majoros - in the preliminary round. Now, the Nigerian star will be heading to Swedish Open, which holds next week in Stockholm, Sweden. After putting the disappointing 4-2 loss to the Hungarian behind him, Quadri restored his pride with a convincing 4-1 win over Czech Republic’s Michal Obeslo. But the victory could not progress him to the knockout stage of the preliminary round. A not-too-happy Quadri said after his victory over Obeslo that: "I think the second match against the Obeslo was much more difficult having lost the first group match. "The first match was a very difficult match because I knew nothing about Hungarian opponent while his style of play was strange with a very strong backhand. "I hope I can play better in the next tournament but it happens like this in sports. I am not going to give up, I just have to continue to play and remain focused in training. "The tournament is tough because the best players in the world are here and I must also commend the organisation of the tournament". For the last ITTF World Tour of 2017 billed for Sweden, Quadri has been seeded number 22 and the tournament serves off on November 13 with the preliminary round while the main draw will start on November 16 to 19.